A long weekend with my daughter, camping at Iluka, gave me the opportunity to put in a few fishing sessions on the rocks at Woody Head. I was limited to fishing when she got up, which meant no early starts, but fortunately, the low tides were mid-morning. The chilly morning weather and occasional showers also made staying in bed a little longer, an attractive option. I wandered out by the boat ramp with my light rod at about 7.30am, thinking I might catch a Flathead or a few Bream on the receding tide. The wind was light from the south west. I rigged up with a 3” GULP Minnow in the Peppered Prawn colour on a ¼ oz 1/0 jighead tied on to a metre of 12lb Fluorocarbon leader and 10lb braid. I was fishing along the line of partially submerged rocks that juts out from the shore just to the north of the boat launching area. I felt a couple of knocks and bumps that did not feel like the rocks and so concentrated my fire by casting in the same area for a few minutes. 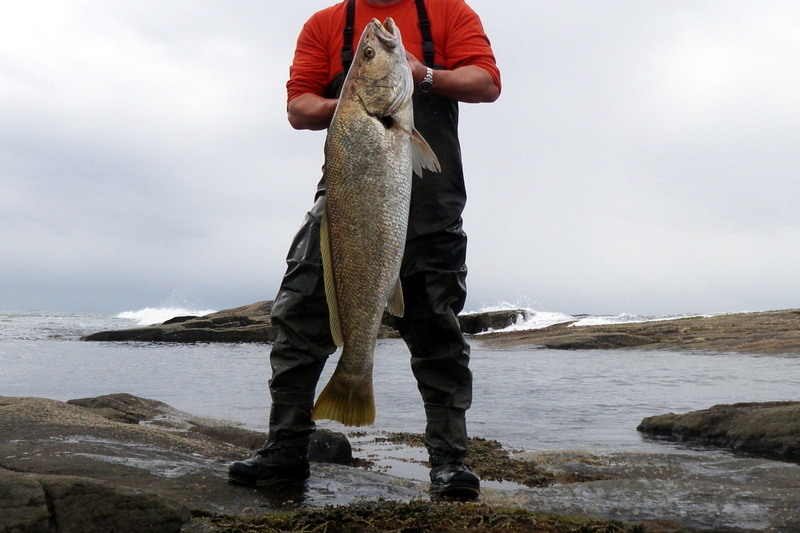 After about ten retrieves, a fish grabbed the lure, just at the edge of the rocks. It took off, jumping clean out of the water. 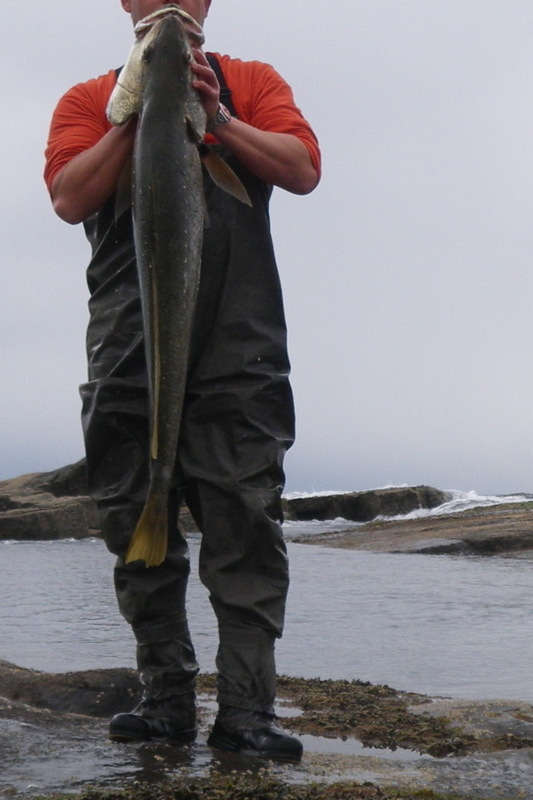 It was an Australian Salmon and it carried on leaping for the next few minutes as I wrestled it to the shore. These fish really fight hard and they just never give up. Every time I got it near the rocks, it took off again and on the light rod it took a while to wear it out. Eventually I dragged it out of the water and took a few pictures. Although they look magnificent and fight hard, they taste dreadful. So I took a few pictures and then released it. After a quick breakfast, I headed out to the rocks at the front of Woody Head, to the area known as ‘the Barnacles’. The weather was gloomy and rain was threatening but there was virtually no swell and a light south westerly wind. Low tide would be around 10.00 am. I was now using the heavy rod – the Daiwa 9 Ft Demon Blood, with a Shimano Stradic 6000 reel – loaded with 20lb braid and 30lb fluorocarbon leader. I loaded up with a GULP Crazy Legs Jerkshad in the Curried Chicken colour mounted on a 3/8 oz 3/0 jighead. I cast out over the rock ledges and let the soft plastic sink for five seconds or so. As soon as I took up the slack, a fish hit the lure. A few more jerks and pauses and I was hooked up to something. 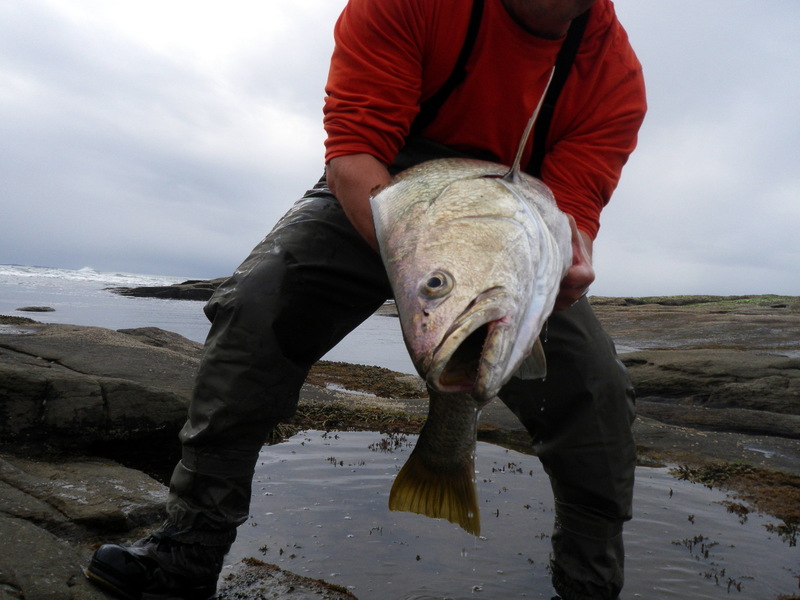 After a quick tussle, I pulled the fish up, over the rocks on an incoming surge, grabbed the leader and landed it. 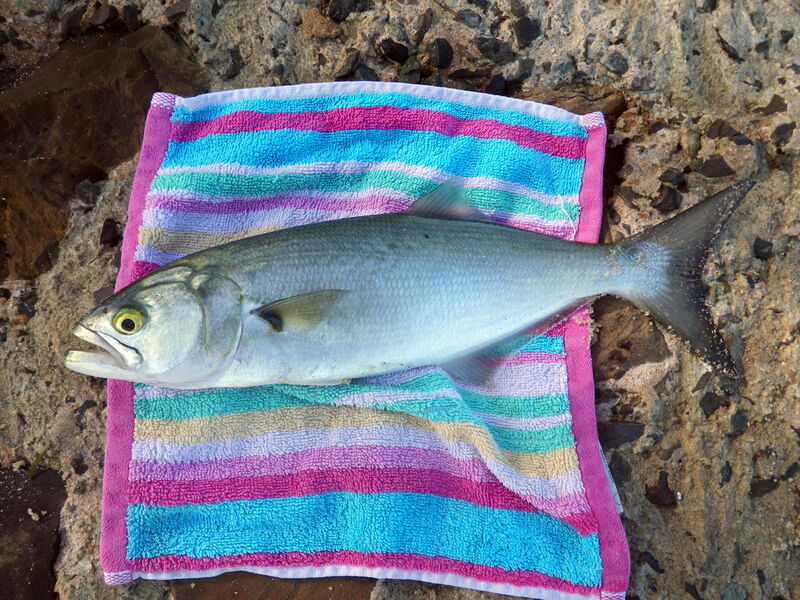 It was a nice Trevally, around 50cm long. The next cast got snagged – so I broke the line and re-rigged with another GULP Crazylegs Jerkshad, this time in the New Penny colour, on a 3/8 oz 3/0 jighead. I cast out again and waited for the lure to sink, when I lifted the rod, I had a fish on the end. It made a long, steady initial run. The steadiness suggested it was a Jew. It swam up and down parallel with the shore a few times then tried to bury itself in the rocks. It seemed like it was stuck but I loosened off the drag and it swam out again. I gradually tightened the drag again and pulled it round to where I thought I could land it. After about 10 minutes it was pretty tired and with the aid of a big wave, I pulled it to my feet and grabbed the leader. It snapped, but I got my hand in behind the gills and pulled it across the rocks. It was a great Jewfish at 10.5 kg (gutted and gilled) and measured around 1.1 metres. It was my ‘personal best’ Jewfish and I was delighted. At 10.30 am after just three casts I called it a day. I had a great fish and I was knackered but I had a very big smile on my face. I managed to persuade myself to brave the cold on Tuesday for another morning of Flathead fishing. As usual I arrived in the dark around 5.30 am, at Bribie Island. I started by fishing soft plastic lures under the bridge lights on the mainland side. The tide would be running out until low at about 8.00 am. There was virtually no wind but it was forecast to become south-westerly at 10 knots, later. I soon found a few small Tailor and numerous Pike. It was a fish a cast, with the Pike, for about the last ten minutes before first light. I could not find any keeper size fish, so I moved back across the bridge and waded out beside the old oyster jetty, just after dawn. I waded along the sand banks, casting along the edge of the weed. I fished right through the bottom of the tide with only some monster Pike to show for my efforts. 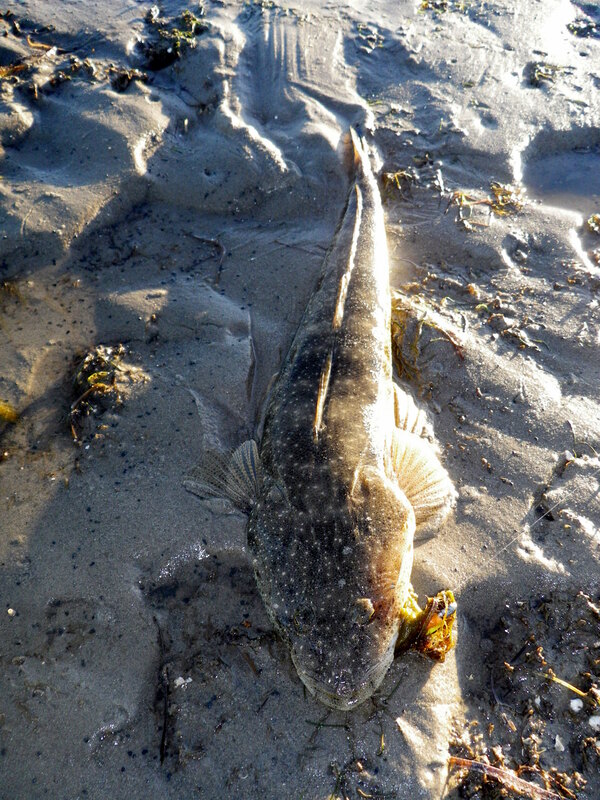 Finally, well into the run in tide I caught a 30 cm Flathead on a GULP 4″ Minnow, in the Pearl Watermelon colour. I caught another, similar sized fish, from the same spot a minute later. After what seemed like several more hours of wading, I ended up with two legal sized Flathead – at 42cm and 51cm – I caught them using the 5″ Jerkshad in the Pumpkinseed colour rigged on a 1/8th 1/0 jighead. After some great sessions recently, the fishing was tough. I presume the Flathead have now moved further up the Passage – they must be around somewhere – so get out there and catch a few. I managed a quick dawn session at Bribie on Sunday. I arrived at around 6.00 am. Dawn and low tide were at about the same time. I was fishing the area of sand banks and muddy weed beds south of the old oyster jetty, on the mainland side of the Pumicestone Passage. I started with a GULP Crazylegs Jerkshad soft plastic in the Pink Shine colour, rigged on a 1/8th 1/0 jighead. I have now upgraded to a 12lb fluorocarbon leader as I have been getting bitten off by the Tailor that are around in the estuaries at the moment. As I waded out I noted how cold the water has become in the last couple of weeks. I presume this is down to the consistent westerly winds. It was a westerly again this morning but not the predicted 10 to 12 knots. The first hour, through the slack water period on low tide, was a bit slow, but as the sun started to really light up the water, I started to catch fish. I had now switched to the GULP 5” Jerkshad in the Satay Chicken colour – basically, yellow on top of pumpkinseed. I opened the account with a monster Pike – at just over 45cm I think it’s the biggest I have ever caught. Around 7.00 am I caught the first Flathead. It was about 35cm long. I then put in about ten more casts in a radius of a few metres of where I caught it. After slowing my retrieve and pausing longer, I hooked up to another – this was a much better fish. I dragged it on to the sand, photographed and released it. It was just over 50cm. I fished on until 8.00am and caught another six Flathead between 30cm and 58cm. They seemed to feed more aggressively once the sun was a little higher over the water and the tide started to run in, solidly. There are plenty of fish in our fridge at present, so I released all the Flathead I caught today. I kept the monster Pike for the cat. If you want to try land-based fishing with soft plastic lures, now is the time in southern Queensland. I expect they are sitting on sandbanks and weed beds in all the major estuaries at present. You will need to wrap up warm though! I only had time for a late morning session on Wednesday. I decided on the Pumicestone Passage again. I arrived at Bribie Island around 9.00 am. It was just about high tide. I decided to go back to the area where I had caught so many Flathead last week – the mouth of the tidal lagoon in front of Buckley’s Hole. The sky was clear but there was a cold, westerly breeze blowing at about 10 knots. The wind was blowing the weed on shore. I waded out onto the sand spit and started walking north, along it to the point where the lagoon drains over the coffee rock ledge into the Passage. I was fishing with a 1/8th 1/0 jighead and using the old favourite GULP 4” Minnow soft plastic lure, in the Pearl Watermelon colour. I had a 10lb fluorocarbon leader. Something aggressive grabbed at the plastic a couple of times but I could not seem to hook up. Usually this means small Choppers (juvenile Tailor) are hanging around. A few casts later, I lost the lure to a bite off. I re-rigged with the same set up. With my first cast I hooked another fish. The frantic headshakes suggested it was a Tailor and then it leapt out of the water to give me a better view. It was hooked nicely in the mouth and I dragged it back to the sand. It was just about legal at around 35 cm, but I released it. Unfortunately then Dolphins turned up. They are beautiful creatures and it is nice to get close to them but their presence does nothing for the fishing! They splashed around just beyond the drop off and made a couple of surges, sending bait flying everywhere. I moved a bit further north and waited for things to settle down. The tide was really running out now. The weed had cleared and the wind had dropped away. 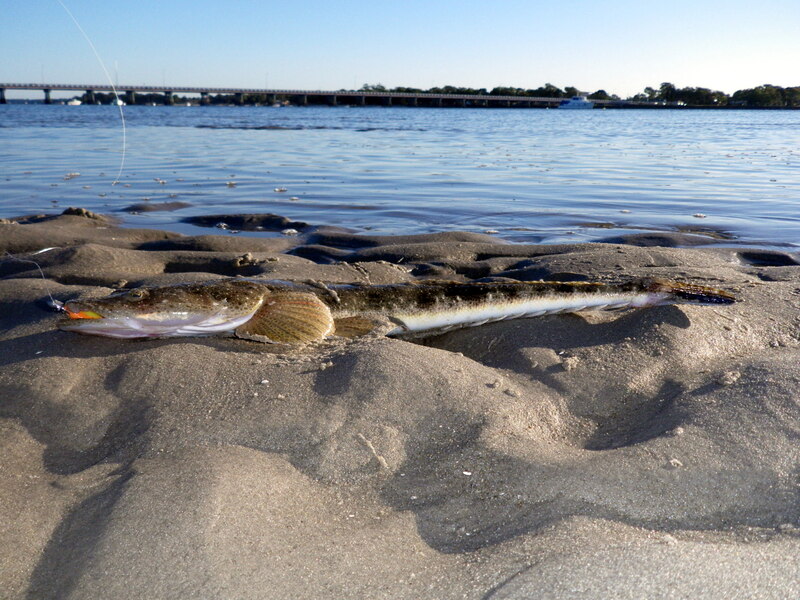 As I waded towards the Island jetty I caught my first Flathead of the day – it was just under 40cm so I released it. I then caught two more small ones from the same spot. I moved further north and cast into the shallow water, just before the drop off. There was a solid thud – I dropped the rod tip and counted to ten. When I picked it up, I had a decent Flathead on the end. I waded back to the steps and landed the fish. 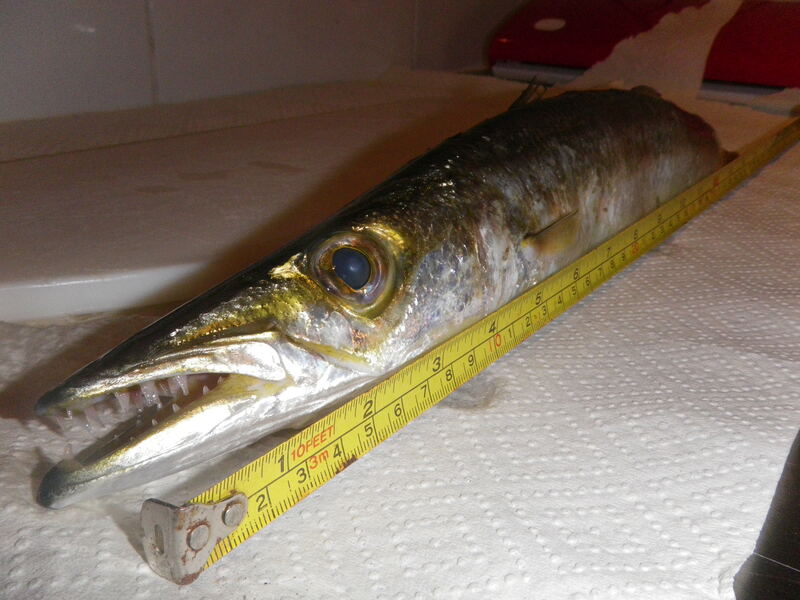 I kept this one for supper – it was just over 55cm. At about 12.45pm I gave up and went home, to thaw out. The fish were certainly not as thick as last week but they are definitely still around. The weather was awful again – but at least it was not raining. There would be a cold westerly all morning, getting up to about 12 knots again. You have to suffer the cold but you do not have to get up in the middle of the night to fish the dawn, at this time of year. I woke up at 4.00 am and reached Bribie just after 5.00 am. First light would be just after 6.00 am and low tide would be at about 10 am. I started on the Island side – beside the boat hire jetty, under the big light on the walkway. First cast, with 3” Pearl Watermelon Minnow on a 1/8th 1/0 jighead, produced a fish. 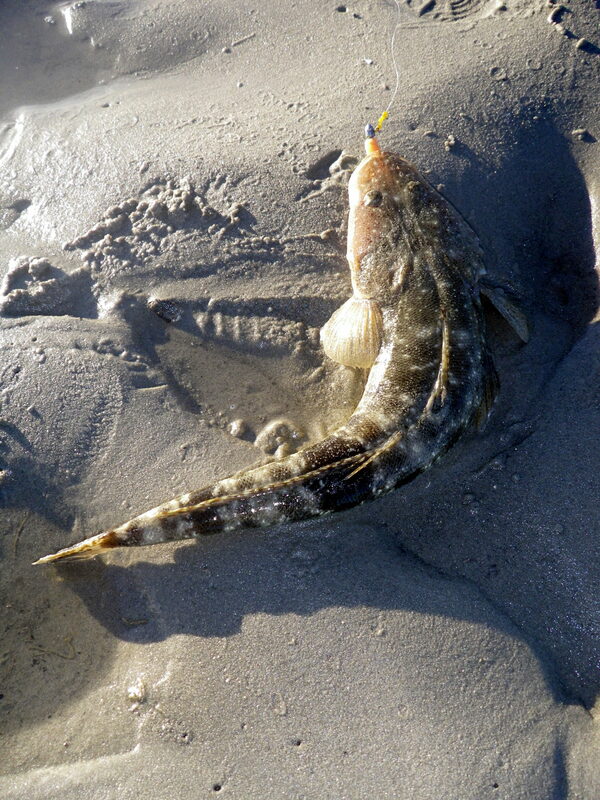 A 25 cm Flathead – it grabbed the lure right at the base of the rocks. I walked south, along the bank and caught a few more – they were all still too small to keep. I soon found a few Pike and then a couple of Tailor, as I got closer to the bridge lights. I caught a few more Pike, under the bridge and then I heard the familiar sound of dolphins exhaling and the fish went quiet. It was just before six, so as the horizon started to glow, I drove down to the mouth of the tidal lagoon in front of Buckley’s Hole. The lagoon now drains out close to the new Bribie Island Museum. As the sun came up, I waded out into the mouth of the drain, where it empties into the Pumicestone Passage. The westerly wind had blown plenty of weed on to the shore but my first cast was grabbed and then dropped by something. A couple of cast later, the same thing happened. I was still fishing with the same soft plastic minnow. I slowed down the retrieve and this time I hooked the fish. It took a bit of line and felt pretty decent then it was gone again. Next cast as lure hit the water, bang – zzzzzzzzzzzzzzzzzzzzzzzzzzzz……………..ptff and I was bitten off. Could have been the Long Tom’s but, from the head shakes, I think it was a Tailor. I re – rigged with a GULP 4” Jigging Grub in the Peppered Prawn colour on a 1/8th 1/0 jig head. I was using my light, Loomis GL2 with a Shimano Stradic 3000 reel. I had loaded it with 10lb braid and about a metre of 10lb Fluorocarbon leader tied on with a uni knot. It was now just after 7.00 am. After a couple of casts over the sand, I caught another small Flathead. Then 10 minutes later I got the first keeper of the day – another Flathead around 42 cm long. Well this spot gradually revealed itself as a Flathead paradise. 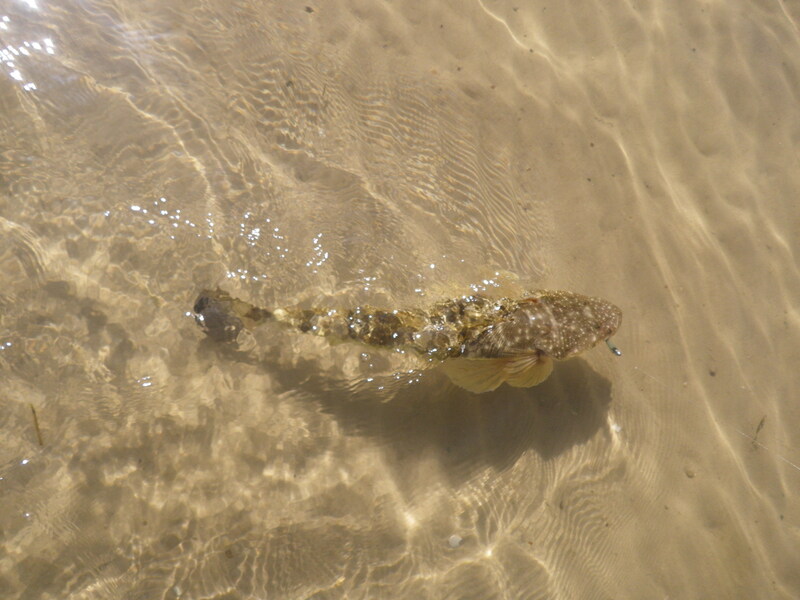 As I moved up and down I caught over 30 Flathead in the next four hours – all over a 200 metre stretch of shore. I tried almost every soft plastic in my bag and they all worked. Of the 30 fish, just over half were legal size. I kept a couple of 50 cm fish for dinner and the rest were released. Conditions continued to get worse with the cold south-westerly wind gradually getting colder and stronger and more and more weed washing up – but it did not bother the fish. By just after 11.00 am – my teeth were chattering and I was feeling vaguely hypothermic so I went back to the car, warmed up and headed home. What a morning!